Ever since people started making coffee they have been trying to find the perfect brewing method. At first people just boiled the water and ground coffee together. Once they figured out that boiling coffee actually burned the coffee and made for a bitter cup they started looking for more things to perfect. Filtering the coffee grounds out of the coffee after brewing was one of them and the Vacuum Coffee Maker is one way to do just that. 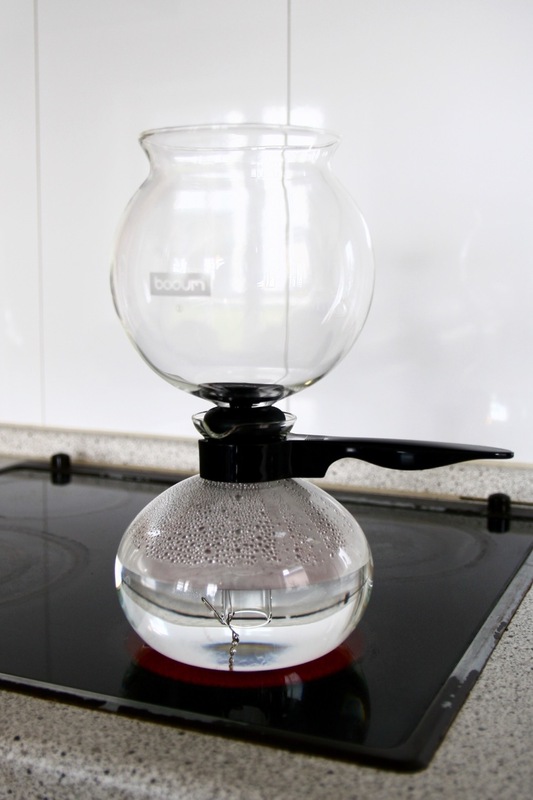 The earliest device that looks vaguely similar to the two glass chamber with a burner underneath that we know today as a Vacuum Coffee Maker, appeared in Germany in the early 19th century. In 1838 Mme. Jeanne Richard filed a patent in France with a reference to an existing design by Loeff of Berlin. It seems that that particular design originated in Germany and rapidly spread to other parts of Europe and the World. In 1835 Louis François Boulanger filed a patent in France and in 1839 Mority Platow and James Vardy did the same in England. Since then many people filed patents for similar devices with small changes, ranging from extra spouts and spigots to offset chambers and self extinguishing burners. Not only have there been many different models of the same basic design, the Vacuum Coffee Maker is also known under a number of different names. Some of its other names are siphon or syphon and vac pot. This brewing method makes use of two glass chambers. The bottom chamber holds the water initially and in many ways it’s similar to the Moka Pot I described in my previous post. Once the water starts boiling the pressure in the bottom chamber rises. That same pressure then pushes the boiling water upwards to the second chamber. In that second chamber we then add the ground coffee, stir a little and steep the coffee. Once we remove the heatsource, the bottom chamber will start cooling down and create a vacuum. That vacuum then pulls the solution out of the upper chamber through the filter back into the bottom chamber. There are a variety of different filters used by different brands, some use stainless mesh, others nylon or even a cloth screen. Turn the heat down low, if the bottom chamber is empty you risk breaking it! Using pre-heated water is optional, but it certainly does speed up the actual brewing process. There are a few ways to influence the taste of the coffee. If the taste of the coffee is too bitter, make sure the water isn’t boiling in the top chamber and / or let it steep less long in step 8. Too watery? Either steep it a bit longer or use more coffee. If you’re using a Vacuum Coffee Maker that makes a lot of coffee, I’d suggest using a thermos of some sort to keep the coffee hot. You can surely use the bottom chamber as a serving vessel but it doesn’t do much in terms of keeping your coffee warm. A Vacuum Coffee Maker is an entertaining way to make coffee. Most people know the regular drip methods and espresso machines aren’t as rare as they used to be. Even French Presses are a common sight these days. The Vacuum Coffee Maker however is a lesser well known method and it makes a very good cup of coffee. It does a very good job at filtering out the coffee particles and you have a lot of control over the brewing process. After using it a few times and making notes of what works (and what doesn’t), I got to a very satisfying cup of coffee. While enjoying my cup of coffee, I’m going to start writing another chapter in my series “Brewing Methods“. If you have any suggestions, questions or comments please leave them in the comments below. Also, if you liked this post please share it with your friends. There are 7 more articles in the Brewing Methods series: The French Press, The Moka Pot, Turkish Coffee, The AeroPress, Hario V60, Cold Brew Coffee and Espresso.